At The Old State House of Web Design and Development, we have seen it happen over and over. Blog regularly and watch your brand climb to the first page in Google generic key word searches in your industry. There is no other way to put this....it works. But let's take that a step further. It REALLY works! And that's simply great for business. So let's take a tour through some Blogs we've built for designers that shine in terms of design and content, and therefore results for SEO for their brands. Although we have designed and built many Blogs, today we want to showcase four honorable mentions because they Blog so often and well. One of our absolute favorites is also from one of our favorite clients. It's interior designer Laura Lee Clark's Blog at her site www.LauraLeeClark.com. They post regularly, like clockwork. And it's always fresh new topics week after week. The content is always informative, and her subjects range far and wide. Laura's "Objet Petit 'a" Blog is an elegant, fun and informative read on all things interesting about fine interior design. Or simply just interesting things she loves. And do a Google search of the words "interior designer" and guess what name shows up on the first page? That's right, you'll find Laura Lee Clark and her site and Blog. And well-deserved. Her design work is brilliant and she's simply one of the best designers anywhere. Make sure to follow her Blog for the best and brightest. 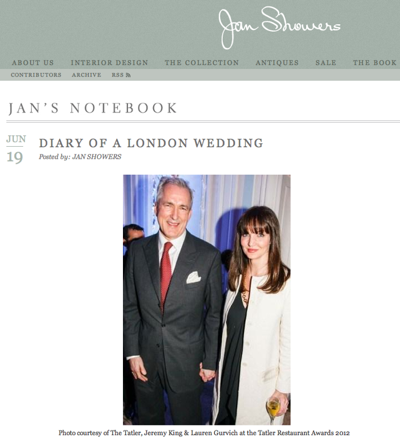 Another Blog we think is well done and interesting is the one from interior designer Jan Showers. She cleverly calls it "Jan's Notebook" and it's a log of her life, favorite things, pictures from travels. And again, the regularity of posting (and Jan Showers is also on that first page of the "interior designer" Google search). Jan offers fine interior design services, but she also has an extensive furniture line and e-Commerce on her site. Quite frankly, everyone loves Jan's site, and they do a fine job of keeping it current and interesting all the way around. 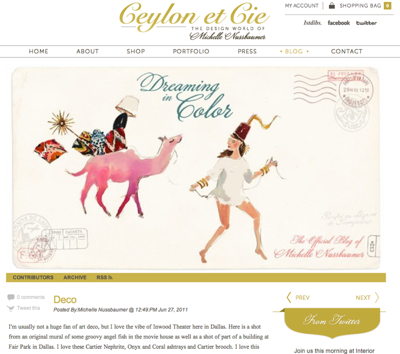 We also like the Blog design and content from Michelle Nussbaumer at her www.CeylonetCie.com. It's short and sweet and colorful....with gorgeous pictures. We love the postcard graphic too as it captures the true essence of Michelle because she's such a world traveler. And it shows on her site and in her showroom on Dragon Street. Literally one amazing thing after another from around the world. Michelle posts on her Blog regularly too, and she often posts directly from her phone. In doing so, you get the feel that you are right there with her sometimes as she travels the globe looking for new finds. Nice work, make sure to check it out. 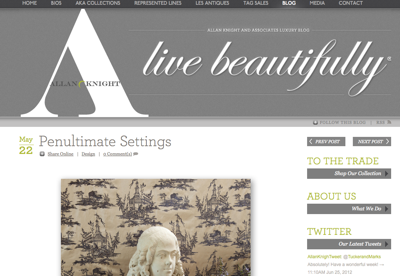 Last but certainly not least is the brilliant Blog "live beautifully" at www.Allan-Knight.com. It's gorgeous. Beautiful pictures, always highly informative and well written. We're proud to have delivered the Blog design, and they are genius at keeping it fresh and alive. Fantastic and it's a must stop. Available to the trade, their showroom in the design district is simply the best anywhere. And by that we mean worldwide! So in conclusion, remember to Blog and Blog often. 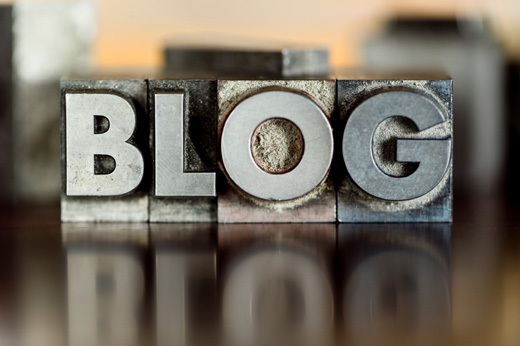 And if you need a great Blog designed for your brand, we'd love to work with you. And in doing so, our guess is you too will shortly have your brand on the first page of Google key word searches!